Former US Army Chief of Staff Gen. Raymond Odierno expressed his frustration at watching the gains he helped achieve in Iraq disintegrate at the hands of the Islamic State, saying that the chaos now unfolding “might have been prevented” had the U.S. stayed more engaged in the conflict. The General who will be retiring in a few weeks, is said to have spent more time in Iraq than any other US army General. He is extensively regarded as a key architect of the Iraq surge. Odierno said the fall of large parts of Iraq was not inevitable, reiterating concerns about the pace of the U.S. troop withdrawal there. He said the USA played a role of "honest broker" between all the groups in Iraq and their subsequent pullout cost them that role. In 2009, while still the top commander in Iraq, Odierno recommended keeping 30,000-35,000 U.S. troops after the end of 2011, when the U.S. was scheduled to pull out. The recommendation was not followed. According to the General: “Two years ago, we didn’t think we had a problem in Europe. Now Russia is reasserting themselves. We didn’t think we’d have a problem again in Iraq and ISIS has emerged. 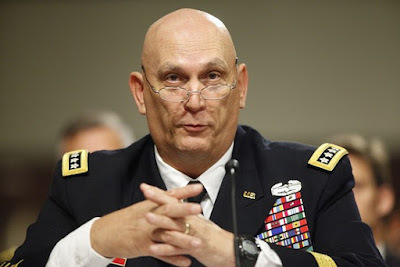 While Odierno insists he supports the recently announced nuclear deal with Iran, he warned that Iran will not change its behavior in the region. He is also deeply worried about recent cuts in the US Army which has hit 14% reduction rate between 2010 and 2015.